The world is urbanising at a tremendous rate. Cities increasingly face challenges of sustainability and quality of life, challenges that put at risk resource and food security, mobility and logistics, water and waste management, health and wellbeing. Cities need metropolitan solutions. Such solutions are made possible by today’s revolution of new technologies and design methods. But no party can do this alone; metropolitan solutions require cooperation between knowledge institutes, companies, cities and citizens. 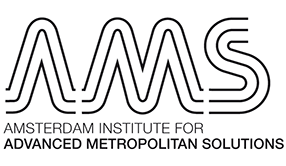 AMS aims to become an internationally leading institute where talent is educated and engineers, designers, digital engineers and natural/social scientist jointly develop and valorise interdisciplinary metropolitan solutions. AMS is centred on applied technology in urban themes such as water, energy, waste, food, data and mobility, and the integration of these themes. AMS will develop a deep understanding of the city – sense the city -, design solutions for its challenges, and integrate these into the city. In that, Amsterdam is its home base and test bed. The city of Amsterdam is in full support of AMS. Besides a financial contribution, Amsterdam will share city data with AMS researchers, express city/citizen challenges, allow the use of Amsterdam as a testing and piloting place for AMS, act as a launching customer for the solutions that AMS creates, provide access to its people, networks and organizations, and support AMS with its excellent brand name. AMS is built by a unique consortium of public and private partners. AMS advocates an open model that lets others that share its vision participate in its research and valorisation activities, make use of its infrastructure, and contribute to and benefit from AMS.